There is a perception, if not a widespread understanding, that anything to do with Jews and everything to do with Israel is acutely political. Throughout its recorded history and deeply divided textual historicity, questions of critical substance, reliability, ideology and theology abound. They may be reviewed, redacted, reformed or reaffirmed, but whichever way the Chosen People and the Promised Land are configured, theology becomes politics and politics is theological. You put a bunch of Jews in a synagogue in Jerusalem to worship the God of Israel, and the business of shul becomes a political process because Israel’s existence and Jerusalem’s status are problems awaiting international resolution. Their slaughter is tragic, but it may be construed as a justifiable political act by the oppressed people of Palestine because Israel cannot be conceived apart from its self-belief: there is no Israeli politics apart from its defining theological self-presentation. Hence the tweets from Liberal Democrat MP David Ward and, for the Conservatives, Baroness Warsi. 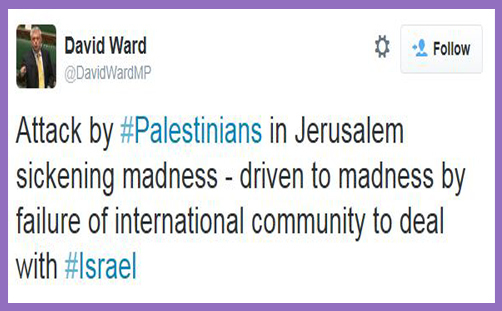 “Attack by #Palestinians in Jerusalem sickening madness – driven to madness by failure of international community to deal with Israel,” says Ward. “Israeli extremists storm Al Aqsa & intimidate worshippers Palestinian extremists storm synagogue & kill 4 worshippers #Tragic #peacenotwar,” says Warsi, then taking a swipe at Tory Chairman Grant Shapps for his hypocrisy. It is quite astonishing moral turpitude to equate a blatant act of terrorism against worshipping Jews with Israeli national self-preservation. It is sickening indeed that the Palestinian “madness” is excused on the grounds of international indifference and the “failure..to deal with Israel”. Deal how? Do what? On what legal basis? With what equitable moral justification? The God of Israel is the God of the whole world. The Jews were chosen, but the Church has been grafted into the vine of salvation. Israeli power, policies and practices may no longer conform to the theological precepts of the Torah, but they remain the things of God because He remains the God of Israel. Power is polluted, politics is partial and policy is provisional. They err because we see in mirrors dimly. But the theology is absolute, and it demands justice and freedom. The political context changes, but the songs of lament and metaphors of opposition remain. Pharaoh vs YHWH has become Hamas vs Netanyahu: it is Israel vs Absolutism, Totalism and Tyranny. Israel’s political life is in tension with its religious expression: the Covenant of YHWH is a relationship which might be used righteously or exploited. But the existential life-and death decisions routinely made by the Israeli government may not be ascribed or apportioned to every Israeli. To slaughter praying Jews in their shul for no other reason than that they are Jews praying in their shul is not a madness which can be blamed on the indolence of the international community. Nor is it equivalent to any protest made on Temple Mount. It is an insufferable act of evil of the subversive sort to which Israel has long been accustomed, and Jews have chronically endured. Slaughter in the synagogue is just politics as usual. That is the characteristic deficiency and true failure of the international community.